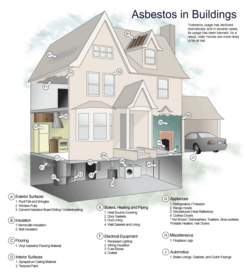 ACMs (Asbestos Containing Materials) may be present if your building was constructed or refurbished before the year 2000, however blue and brown asbestos was banned in 1985 and in some cases ACMs such as textured coatings were used up until 1999. A risk assessment is essential to help you comply with the new duty. The Asbestos Group will carry out a survey and once complete it will be presented in a fully bound report comprising a risk assessment and management of asbestos strategy. This will act as your asbestos register and a log for any ACMs present in your building. It is the foundation of the ‘Duty to Manage Asbestos’ regulations within your premises. In order to have an effective asbestos management programme, it is necessary to establish clear lines of responsibility for the programme’s management and implementation. Several of the management options apply to all ACMs and are required by CAR. Others are appropriate for ACMs which have a high material or risk assessment score. Guidance on risk assessment and the management of asbestos will be available from The Asbestos Group.